When business operators use repeatable processes and unified software to manage risk and compliance, the benefits are huge. Every part of the business becomes more agile, resilient, risk intelligent and confident. 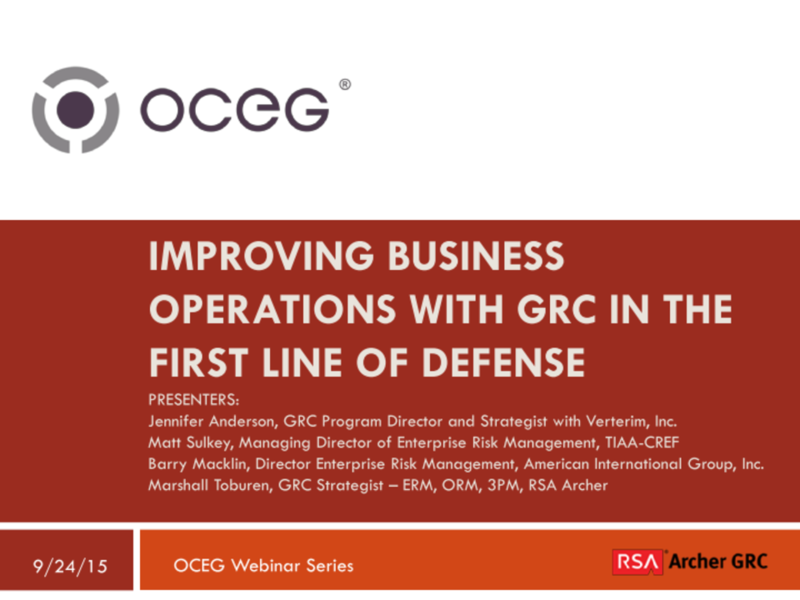 In this webcast, a panel of tenured practitioners will discuss how improving business operations with GRC helps you improve your business processes, gain risk intelligence, and contribute to planning for performance by building the first line of defense for your organization. Barry F. Macklin, Director Enterprise Risk Management, American International Group, Inc.
We have emailed instructions to access Improving Business Operations with GRC in the First Line of Defense Slide Deck to . Make sure the email arrives in your inbox: either add "support@oceg.org" as a safe sender to your email platform, or if you use Gmail, drag our email into your Primary tab.